Gold Leaf Size is a white, liquid adhesive suited to working with gold leaf sheets. It is quick drying and irremovable. Please Note: Not be used as a top coat or varnish. 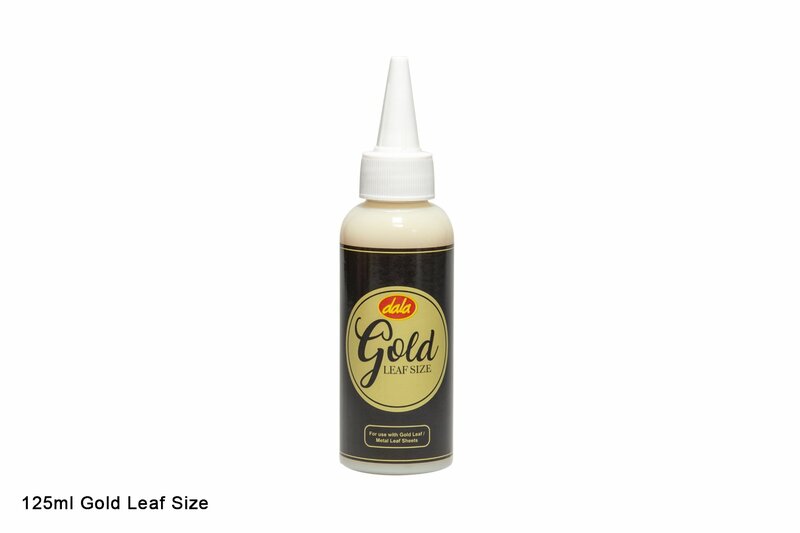 Use Dala Gold Leaf Varnish for a glossy overcoat. Work in a draft free area with the windows closed. Ensure that your intended surface is clean and dry. Apply a thin, even coat of Gold Leaf Size using a paintbrush. Leave for a while to get tacky (± 30 minutes). Gold Leaf Size will feel quite sticky when ready to apply the gold leaf. Gently burnish the Gold Leaf using your fingers and leave to dry for a few minutes. Then using a stiff, dry brush to remove the excess Gold Leaf. Can be varnished using Dala Gold Leaf Varnish. This item has 326 views.